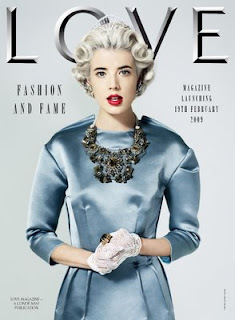 Love magazine's first issue is all about the "Fashion and Fame," according to three newly-released previews — which feature Iggy Pop, a violet-haired Iris Strubegger, and Agyness Deyn as Queen Elizabeth II. It's only two weeks now, and Katie Grand is already planning a big launch on Feb. 19 when the magazine comes out. Those attending London Fashion Week will be able to score the first issue — they'll be handed out at various shows..